Rare ring, lvl 70, with the usual 4 primary and 2 secondary affixes. "Rare" refers to items or monsters with yellow-colored names and special, randomized properties. See the Elite Affixes article for details about "Rare" monsters. Rare can also mean "uncommon" in the more general adjective sense of the word, hence some Legendary items with the lowest drop rates can be called "ultra-rare" which is a little confusing since "Rare" is the term for another whole time of non-legendary item. Rare items in Diablo 3 spawn with up to 6 random affixes (up to 4 primary and 2 secondary, after the system was redesigned in D3v2 and Loot 2.0). Rare items share the same pool of affixes with magical items and legendary items, but the possible numbers for each affix differ between the item types. On the whole, Rares are designed to be good, but not great. Rares are very common items, via monster drops and gambling, and a character newly arrived at the max level will will quickly find or gamble Rare item upgrades to most item slots. Longer term, players should plan to replace most or all of their Rare items with Legendary items, since these have bigger and better stats. Attributes: Rare: +350-415 vs. Legendary: +416-500. Life%: Rare: +8-14% vs. Legendary +10-15%. All Resistance: Rare: 81-90 vs. Legendary 91-100. 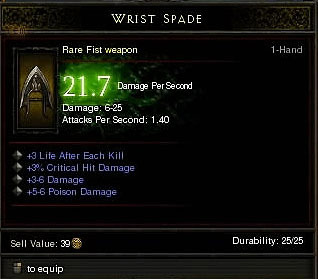 Obtaining Rares required some luck shortly after Diablo 3 was released, but they became more common in several patches and ultimately lost value. During most of Diablo 3 vanilla, most types of Elites (Champions and Rares especially) dropped at least 2 Rare items, and up to 4 or 5 for players with very high Magic Find. One of the itemization changes in Loot 2.0 was a reduction in the total number of Rares dropped, along with several changes improve the quality of the Rares (and Legendaries) that did drop. This was done largely through the Smart Loot system. Reaper of Souls introduced gambling via the NPC Kadala. Gambled items during the RoS beta test were split about 50/50 between magical (blue) and Rare, with a very low % chance of scoring a legendary. Upon release to gambling odds had been tweaked to increase the chances of getting rares and legendaries, and several post-release patches further boosted the chances of a legendary from gambling. As of Patch 2.0.5 in May 2014, gambling returns something like 9/88/3 magical/rare/legendary items per 100, though opinions and runs of luck vary greatly over time. There's a huge results thread of use for reference. 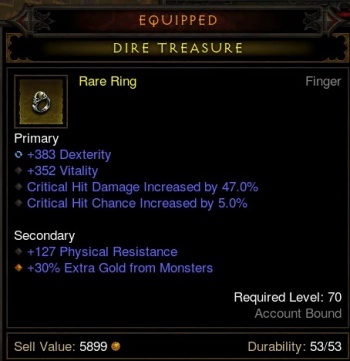 On the whole, Rare items drop like candy in Diablo 3 version 2 and Reaper of Souls, and experienced players soon gear up to the point that Rares are not possible upgrades in any slot (except perhaps jewelry or gloves), and thus Rares have value solely to sell for gold, or to salvage for materials. Early rare crafted fist weapon. Rare items in Diablo III can either be drops, or they can also be crafted. According to Bashiok, rares will be amongst the best items in the game . If we do things right we’ll see end-game players with a mix of legendary, rare, and crafted items. This is ignoring the fact that rares can be crafted, of course. It is currently unknown as to if rare items will follow the Diablo II model by having unique, randomly-generated names. More information about other item types can be found in the item category entry. This page was last edited on 8 June 2014, at 02:15.